The practice of Dr. Daniel Juarros & Dr. Myla Villanueva D.M.D. is a unique combination of the very latest in dental technology and expertise together with the old fashioned values of caring and service. 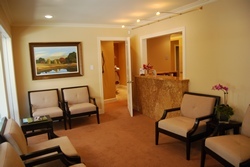 Dr. Juarros Dr. Myla are compassionate and sensitive and pride themselves in gentle care. The front office staff works to assure that every detail of your treatment goes smoothly from scheduling your appointments to helping you research and maximize your insurance benefits. Both doctors are passionate about making your dental experience exceptional. The very latest in dental technology is installed throughout the office including the most up-to-date sterilization equipment, digital x-rays, intraoral cameras. Nitrous oxide (laughing gas) is available in each operatory for your comfort. We are devoted to your highest level of dental health while restoring and enhancing the natural beauty of your smile using conservative, state-of-the-art procedures that will result in beautiful, long lasting smiles! We believe that preventative care and education are the keys to optimal dental health. We strive to provide “dental health care” vs. “disease control”. That’s why we focus on thorough exams – checking the overall health of your teeth and gums, performing oral cancer exams, and taking x-rays when necessary. We also know that routine cleanings, sealants, and fluoride are all helpful in preventing dental disease. Not only are we focused on the beauty of your smile, we’re also concerned about your overall health. Infection control is also very important. To protect our patients and ourselves, we follow sterilization and cross contamination processes using standards recommended by the American Dental Association (ADA), the Occupational Safety and Health Administration (OSHA), and the Center for Disease Control (CDC). We have the most sophisticated sterilization equipment possible. Building a foundation of trust by treating our patients as special individuals is vital. We understand how uneasy some patients may feel about their dental visits, and how we can make a difference in providing a relaxing and positive experience. Our entire team is dedicated to providing you with excellent, personalized care and service to make your visits as comfortable and pleasant as possible. We thank you for allowing us to take care of your dental needs and look forward to serving you.